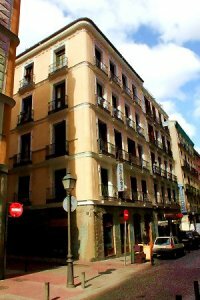 CHUECA PENSIÓN is a little and charming hostel with only 8 rooms, simply goldens. It's located in the heart of Chueca's neighborhood, the gay and lesbian district of Madrid. We speak english and french. 2. Hostal La Zona. Gay Hotel, Madrid. Our hostel has 14 rooms with outdoor balconies, private bathrooms, flat screen tv, free wifi and heating / air conditioning. We are mindful that you feel comfortable at all times. We are a gay hostel open to all those who feel comfortable and integrated into this environment. You'll find yourself surrounded by nice people from all over the world. Good value, hostel type accommodation in Madrid for gay people worldwide. Gay friendly accommodation in Chueca gay scene: gay bars, gay discos and gay clubs. Sitges accommodation near Barcelona including apartments, villas & hotels -Sitges holiday apartments, guesthouses, rooms, villas & hotels near the beach. Holiday rentals in Spain including cheap accommodation in Barcelona, Sitges, Gran Canaria, Ibiza, Madrid, Granada - Villas, apartments & hotels in Spain.